Well maintained park, friendly & helpful staff. Free WiFi, no extra charge for dogs 10% discount for AAA, AARP, Good Sam or just being seniors Level, gravel sites, well-placed hookups. Horseshoes, boccie ball & new ring toss, beanbag toss, putting green & central BBQ. Immaculate key lock bathrooms & showers with lots of hooks and shower/dressing seats (very cool idea!) 2 guest clubhouses, well stocked store (no food) Hiking, shopping, Film site of Hitchcock's "The Birds" No tents, very windy while we were there. Adjacent to Bodega Dunes State Campground HIGHLY RECOMMENDED!! We stayed in a TT for two nights and paid $44 (incl tax) per night Enjoy! We only stayed one night but it was a friendly park. We got a pull thru site, the dog had a little fenced potty area (all gravel). Only noise was the every 10 second foghorn. When we checked In the front desk staff seemed disorganized. We ask for a Good Sam Discount and the man got snotty with us and commented he does not need to give a GS discount because it is busy season and he can charge whatever he wants and will still be full. Our friends checked in shortly aFter us and received a similar treatment. Good Sam should reconsider including them as a rated facility. Otherwise: The sites were intimate and nicely maintained. Restrooms and showers were clean not spotless as some have commented. Shower shoes needed. Dog park is all rocks. We walked our pup on the adjacent trails and park area. Located next to a lovely state park with 50+ camping spots. 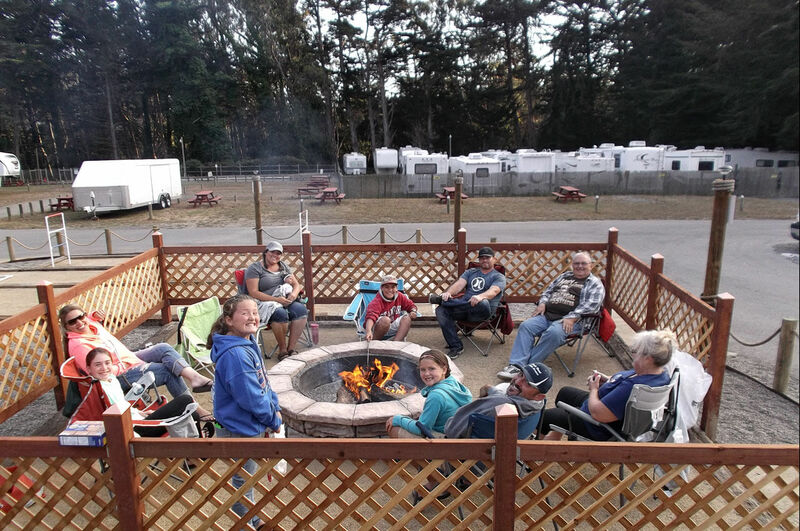 We stayed for five nights at Bodega Bay RV Park in our 40’ fifth wheel and were satisfied with our stay. We were fortunate to be able to upgrade to site 25, a FHU site that sits next to the bathhouse. Our pull-through was gravel and was plenty long enough to hold our rig, tow vehicle and extra vehicle (extra $5 per night). The site was an adequate width and had a fence between us and our neighbor. The roads were wide enough that there was no trouble maneuvering a big rig through the campground. The campground was tidy and well maintained. The office staff was friendly and helpful. The bathrooms and laundry room were well maintained. The laundry room has 3 washers and 3 driers ($2 each per load). It didn’t have many other amenities but we were there to visit the area, rather than hang out in the campground. The wifi worked pretty well most of the time. 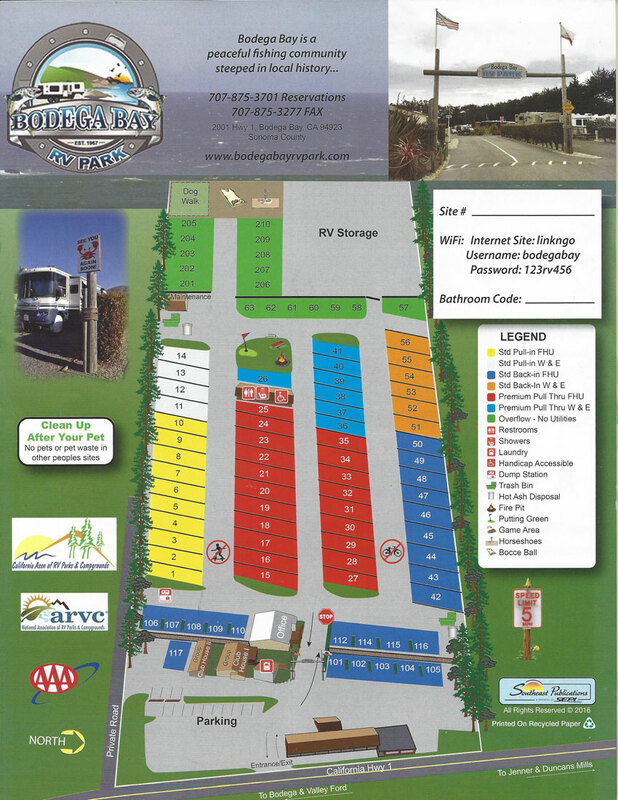 The campground is about a mile north on Hwy 1 from the center of Bodega Bay. The drive along Hwy 1 can be a challenge in a big rig but it’s certainly doable is you go slowly around the curves. Although the rates were higher than we were used to paying, there weren’t many other options close to the town and it is California. We spent a few nights here and loved it. The sites are level, the WiFi works, the power pedestals are perfect too. I didn't hook to the cable so I can't say anything about that. The bathrooms are clean and very nice. I would stay here again. Was very quit. The park was clean, my dogs love the little dog fenced in yard they love that they got to off there leash. The staff were friendly and helpful, giving us information on things to do here. Would stay here again. 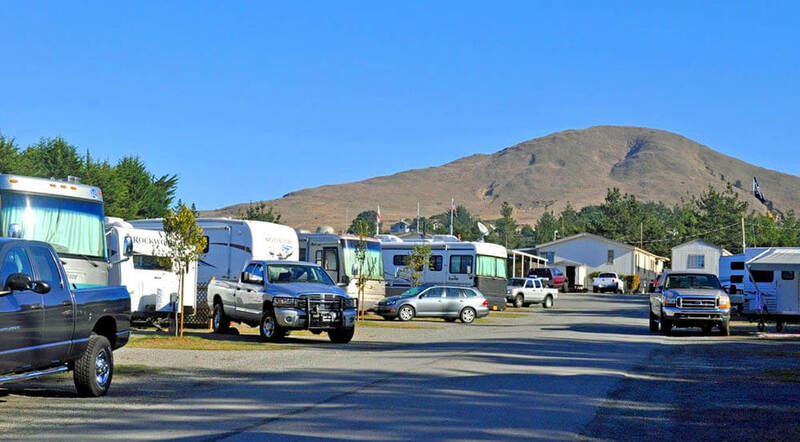 The RV park is clean and the staff is friendly. Good wifi. The spaces are small, and you have to pay $10 for a fire pit. Never had to pay for a fire pit in my 30yrs of RVing. 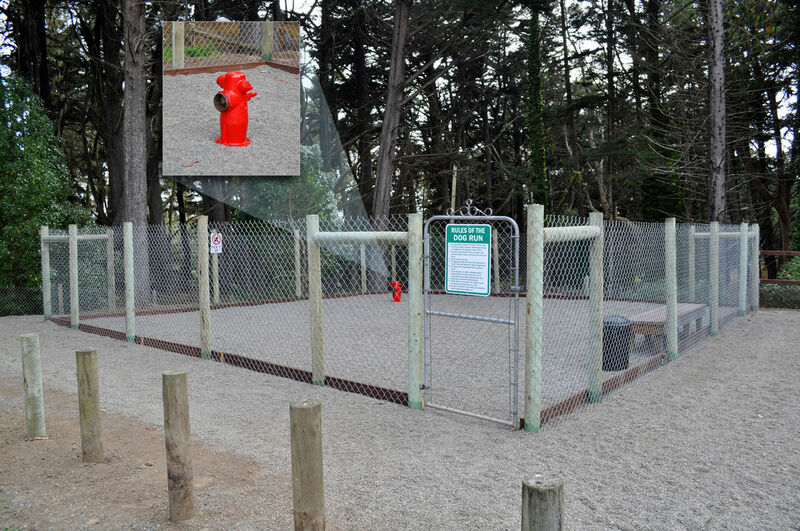 There's a dog area, but it's stone gravel and small. We decided to only stay one night. This whole area, of course, is spectacular. Very nice RV park. I thought the spaces were not too tight. People friendly. Didn't use bathrooms or laundry so can't comment on that. Bring a tow if you plan on going to town, though. Too far to walk. So much to enjoy in this area! Overall we enjoyed our stay here. The park is close to town and the beach. The park was very clean, and the staff was very friendly. The only disappointment was that we paid for a space with full hook ups, and the cable wasn't working. While talking to other visitors it seemed to be out in the whole park. The staff did not offer any kind of compensation for this even though we paid extra to have cable. Very nice place to stay. The staff is super friendly and were very sweet. Park was very clean and well taken care of. Been here twice. This time we came to Bodega Bay to dry camp at Doran Beach but had some issues, so swung by here and inquired about moving here instead. They were so nice and accommodating, and secured us a nice spot right away. It's been a delightful, quiet weekend getaway. Level spots, very clean, nice people, great doggie area. Minutes away from the beach. I am a runner and enjoyed a few nice runs right to the beach. We will always come back here when in Bodega Bay. They have our business! 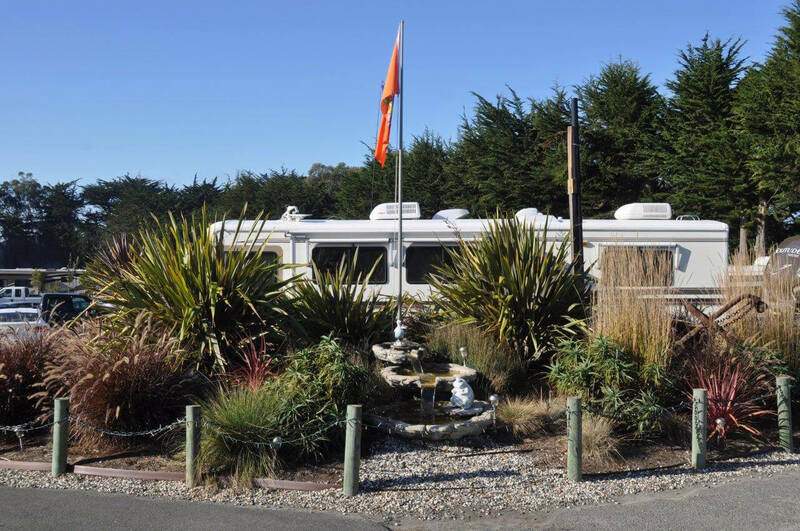 Since 1967, the Adams Family have been your hosts at the Bodega Bay RV Park. We are constantly trying to improve our park and its facilities for the benefit & enjoyment of our guests. 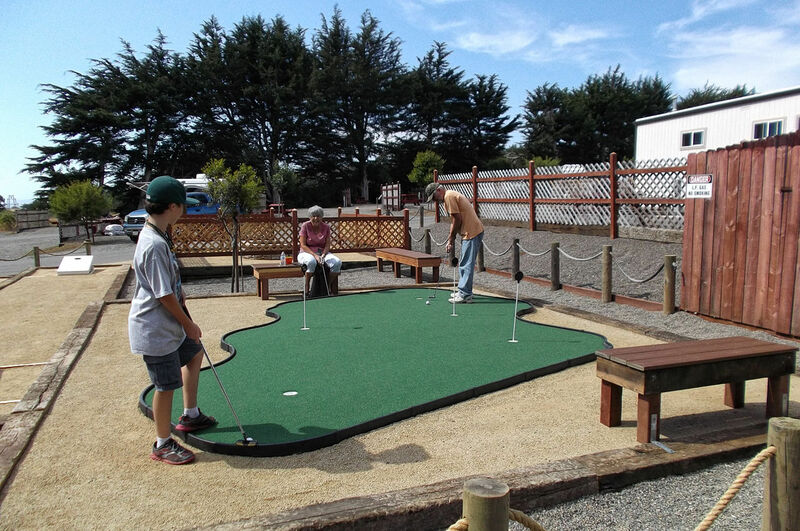 Bodega Bay and the surrounding communities offer lots of activities for nature lovers, and outdoor enthusiasts. Whether you are staying for a couple of days, or a couple of weeks we will do our very best to make your stay an enjoyable one!